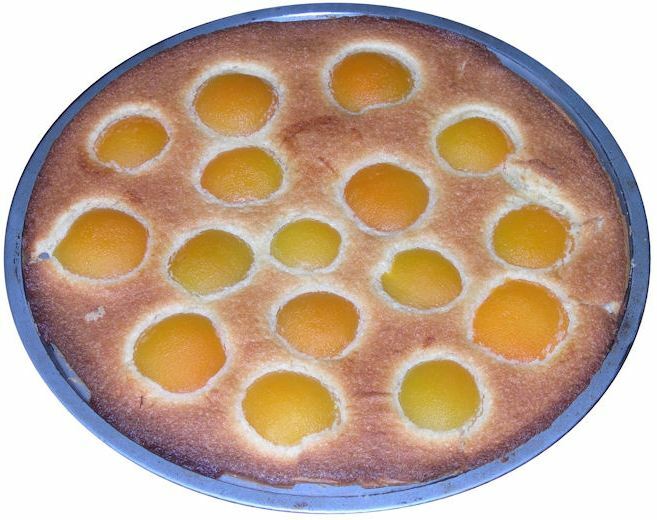 This is a recipe for a quick & easy apricot tart that I obtained from Marie-José "Zézé" Fournier. 1 standard package of ready-made of pâte sablée from the supermarket. Pâte sablée is the richest of the two basic forms of French shortcrust pastry dough (the other one being pâte brisée). It has a crumbly, sandy texture, hence the name. Often used for tarts, quiches, etc. Can be sweet or savory. The apricots must be drained well, but there is no need to pat dry with kitchen paper. Unroll the sheet of puff pastry dough onto the pizza pan. Do not remove the oven paper underneath the dough! Depending on the oven (fan, top + bottom heat,..) you may want to first bake for 5 minutes with the rack at the lowest position (to ensure that the dough gets baked through), then move to the middle of the oven. My recipe for a similarly sized thin apple or fig tart is here. ©2005 M.-J. Fournier. All rights reserved worldwide. No part of this publication may be used without permission from the author.